True Mother spent much of her childhood at the home of her maternal grandmother, Jo Won-mo, as well as with her mother, Hong Soon-ae. Both her mother and grandmother had dedicated themselves to a life of faith in order to welcome the Lord at his Second Advent. After coming to the South from the North, True Mother began studying at Hyochang Elementary School in Seoul. She moved to Daegu, Seoguipo on Jeju Island, and to Chuncheon in Gangwon Province, all the while continuing her schooling. True Mother met True Father in 1956, when she was 13, soon after her graduation from elementary school. Mother recalled what Father had told her about their first meeting, "Closing my eyes, I spoke to God in a whisper, ‘God, thank you for sending such an extraordinary woman to this nation of Korea.'" For a long time, God made preparations to send the Returning Lord and Heaven s Bride. Then, through the Marriage Supper of the Lamb, True Father and True Mother emerged as the True Parents of humankind. For God to send the Returning Lord, His begotten Son, to earth, He conducted a special providence. He did likewise to send Heavens Bride to be His begotten Daughter and the embodiment of the Holy Spirit. Heaven prepared many Spirit-led churches in order to send True Mother as the new Eve. Around the time of True Mothers birth, many spiritual churches emerged on the Korean Peninsula. With her family centrally involved in them, their purpose was to prepare for True Mother. 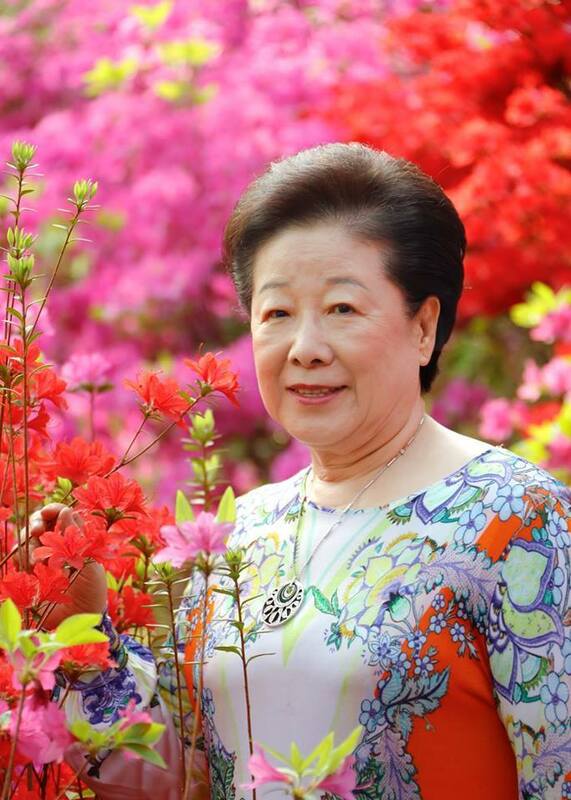 True Mother was born on the 6th day of the l5' lunar month (February 10) in 1943, at her maternal grandparents' home at number 26, Shineui village in the township of Anju, South Pyeongan Province. She was the only daughter of her father, Han Seung-oon, and her mother, Hong Soon-ae, who later received the title Daemonim. 4 In Korea there were many special Spirit-led churches. These were different from conventional Christian churches whose members were comfortable with formal worship and with the blind and simple faith that, just by believing in Jesus and the Bible, they would be able to go to the kingdom of heaven. These churches received numerous revelations from God that they should make preparations to welcome the Lord at his Second Advent and find the Lord's Bride. Such was the landscape of faith in Korea following the Second World War. I was born into a family that was spiritually prepared, whose preparation included participation in those Spirit-led churches. Today as I reflect upon the circumstances of that time, I am drenched in sorrow. It is because I recall memories of the indescribable suffering endured by the churches to which my mother (Daemonim) belonged. The members of those churches lived entirely according to the divine revelations they received. These revelations directed them to walk an indemnity course in order to prepare an easier path for the Lord. It was an unbelievable course filled with difficulties and hardships. Some of those members died in prison. Having been called by God to prepare for the Messiah, they overcame their difficulties by carrying with them only the hope that someday they would be able to meet him. So, with devotion and attendance, they made extensive preparations to welcome the Returning Lord. Among the things they did was to prepare everything for him, from spoons for him to eat with to clothes for him to wear. The revelations they received were so detailed that they knew even the size of his clothes. True Mother's birth was significant because it was the fruit of God's providential history. Her birth transcended the birth of an individual; it was the fruit of 2,000 years of Christian history, and it was linked to the Spirit-led churches that arose in Korea to welcome the Lord at his Second Advent. These churches produced this fruit through three generations: her maternal grandmother, Jo Won-mo; her mother, Hong Soon-ae (Daemonim); and finally True Mother herself. Specifically, shortly after the birth of True Mother, Rev. Kim Seong-do of the Holy Lord Church died in prison from the torture she received there. Thereupon the mission was passed down to the Inside the Womb Church led by Rev. Heo Ho-bin. As Rev. Heo was also imprisoned, her mother, taking her place, testified to True Mother, who was six years old at the time. She blessed her, saying, "You will be Heaven's Bride." Even before the birth of True Mother there were prophecies about her, such as, "She will become the queen of the universe." Through this process, the foundation of these churches' conditions of devotion to receive the Lord at his Second Advent was passed down to True Mother. 5 My father, Han Seung-oon, was born in Anju; he worked as a teacher all his life. Although he was a strong and robust man with a large frame, he had an eye for detail and he was always serving others. Most notably, he was a devout Christian; he also worked as a leader at the New Jesus Church led by Rev. Yi Yong-do. As a believer and educator, his life was always busy. When my mother (Daemonim) moved to Anju with my grandmother, they attended the New Jesus Church in Anju to continue their life of faith. That is where my mother and father met and came to know each other, and eventually ended up marrying. 7 In North Korea, as the power of the communist authorities grew stronger, the persecution of religion became severe. In August 1946, Rev. Heo Ho-bin was taken to the Daedong Detention Center in Pyongyang. While in jail she received a revelation that she would meet the Returning Lord. Around the same time True Father was arrested while evangelizing in Pyongyang and was taken to the same jail. While in the jail, True Father managed to send a note to Rev. Heo through her chief disciple. However, the note was discovered by a prison guard and True Father was tortured so severely that his teeth were broken. 8 Rev. Kim Seong-do's church was on the west coast of North Korea. After she died, Rev. Heo Ho-bin became its leader. True Mother's mother (Daemonim) was a devout member of that church. She first brought Mother to that church when she was four years old, and Rev. Heo's mother gave her blessing to Mother when she was six. That blessing symbolized the bequeathal to Mother, the succession of the mission to attend the Returning Lord. Shortly after True Mother was born, her father, Han Seung-oon, named her Hak Ja, choosing hak according to a dream in which he saw two cranes. Hak means "crane" and ja means "son," and is often used to mean "child" in women's names. True Father gave a different interpretation, "She will come forth as the partner of God, by becoming the greatest scholar (another meaning for "hakja") of God's bitter sorrow." He said, further, "The last character of her name, ja symbolizes that she is destined to be bonded with God's prince." True Mother's father, Han Seung-oon, was born January 20,1909, and died on March 18, 1978. His father was Han Byeong-geon, his mother was Choi Gi-byeong, and he was the first son among five siblings. In May 1946, while working as a schoolteacher, he fled to the South. After that he worked as a teacher in elementary schools in Seoul and in Gyeonggi Province until February 1974. He dedicated 41 years of his life to being a teacher, in both North and South Korea. Hong Soon-ae (Daemonim) was born on the 22nd day of the 2nd lunar month in 1914, into a devout Christian family. Her father was Hong Yu-il. Her mother, Jo Won-mo (who lived from the 7th day of the 11th lunar month of 1889 to the 3rd day of the 9th lunar month of 1962), bore him one son and one daughter. Daemonim was their first child. Jo Won-mo, True Mother's maternal grandmother, was a diligent and active woman like contemporary women. It is known that one of her ancestors, Jo Han-jun, built a significant stone bridge across the Dallae River at Jeongju in North Pyeongan Province, investing his entire fortune to build it. 3 True Mother's maternal grandmother Jo Won-mo was a direct descendant of Jo Han-jun. The character jo of her family name means nation. It signifies that Daemonim s mother was in the position of a mother of the nation. That is the way the generations of her family tradition connected through history. Here is a true story: After no one had repaired or maintained the Dallae Bridge in Jeongju for many decades, it started to deteriorate. Eventually it reached the point that people could not cross the bridge, and the road was blocked. Remnants of the broken bridge created an obstruction that caused the river to overflow its banks, and it was buried under the sand and mud of the river. 4 In order for Chinese envoys to travel to the seat of Korea's government, they had to cross the Dallae River at Jeongju. However there was no bridge for them to cross, and at that time the government did not have money to build one. So the government posted a bulletin, seeking someone to build a bridge there. That is when Jo Han-jun, my maternal grandmother's ancestor, built the bridge with his personal wealth. He made it a large stone bridge under which boats could pass. 5 According to legend, when the people saw the stone Maitreya standing on the hill, they thought it had sprung up from underneath the ground. They built an open shrine for the statue so that it would not be exposed to the elements. Then the Maitreya statue began to grow. It grew bigger and bigger until it pierced the roof of the shrine, and the shrine had to be rebuilt. Then, strangely enough, the statues belly began to bulge, and when it did, so did the bellies of all the daughters in the Jo clan. This caused a big misunderstanding among the villagers, who thought that the unmarried girls had become pregnant out of wedlock. True Mothers ancestral home is located in South Korea, in Cheongju, North Chungcheong Province. According to Father's explanation, Chungcheong means "a pure heart and a clear mind" and Cheongju means "a village that is clear and pure." When river or ocean water is clear, we can see fish and other things deep in the water. Likewise, Cheongju signifies a village of people whose hearts are pure and minds are clear, who seek to become the people of the Way. True Mother's family name Han, comes from the Cheongju Han clan, and it represents Korea, the Han nation, Hanguk. In addition, it represents the universe, since Han also signifies hana, meaning the first, or number one. That is why God prepared Heaven's Bride with the name Han from the Cheongju Han clan. 9 Korean historians state that before the Gojoseon era there was a nation governed by Emperor Hwan-ung. It was he who begat Dangun, the first ancestor of Korea. The word hwan is an old pronunciation of the word that in subsequent Korean history came to be written hart. That is why people often refer to Hwan-ung by the name Han-ung. Of course, some people disparage this part of Korean history as mere mythology. However, hidden in the myth of Dan-gun is God's Will to choose the Han people as the people of heaven's lineage. Artifacts and related data associated with that era are being discovered, and they are proving that the mythology has a basis in fact. 13 The Korean alphabet was revealed during the reign of King Sejong, who promulgated it as Hunmin Jeongeum, meaning "the teaching of correct sounds for the people." The name can be interpreted to mean that those who teach and learn what is right will continue on, even if their country falls into ruin. I came to learn that the Dongyi people (another name for the Korean people) have such a history and character. Beginning around 1900, while God was initiating the providence to send the returning Messiah to the land of Korea, Spirit-led churches began to emerge. These were led by devout Christians who had advance knowledge about the providence of God. The work of these churches began with the New Jesus Church led by Rev. Yi Yong-do, was passed to the Holy Lord Church of Rev. Kim Seong-do, and culminated with the Inside the Womb Church of Rev. Heo Ho-bin. As these churches searched for the Returning Lord, they also created the foundation for God's providence to welcome Heavens Bride. 2 Among people doing this spiritual work was Rev. Kim Seong-do, who lived in Cheolsan. Another spiritual leader at that time was Rev. Baek Nam-ju from Hamheung, who was granted authorization by the Japanese governor-general's office in Korea to lead the Holy Lord Church. This was possible only because of guidance from the spirit world. The spirit world gave a message to Rev. Baek to walk barefoot from Hamheung to Cheolsan and meet Rev. Kim. Although the distance was some 240 to 280 kilometers, he walked barefoot and met Rev. Kim. In this way, east and west united. 3 When Rev. Kim Seong-do and her family failed to fulfill their responsibility for her mission, it was transferred to a woman who faithfully attended her, Rev. Heo Ho-bin. Rev. Heo's whole life was focused on the Returning Lord. Heaven taught her how sin could be removed, how to live a daily life of attendance to the Lord, and how children should be raised after the Lord's coming. Rev. Heo set up all the necessary traditions for living in attendance to the Returning Lord. Rev. Heo had to make these preparations before Korea's liberation from Japan in 1945. The Principle of Restoration is such that she needed to do this work during the seven years prior to the liberation. Then, God's plan for the Returning Lord could have been fulfilled at the time of the liberation. The Messiah could have inherited the foundation she had built and initiated a new history. 4 Two thousand years ago in Israel, God made many preparations before the birth of Jesus. He prepared the people of Israel ahead of time to welcome Jesus. He prepared so that Jesus could have his heavenly family, unite the nation and then bring salvation to the world. However, the central figures of the providence at that time cared more about their daily lives than about God's circumstances or His profound Will. As a result of their not recognizing and attending Jesus properly, Jesus was sent to the cross. During the 2,000 years since Jesus' resurrection, God has been working through Christian culture to awaken and prepare people as brides to attend the Returning Lord. He called Korea to be His chosen nation. Although Korea has but a short history of Christianity, God led the people of Korea to establish churches to make internal preparations to welcome the Returning Lord both before and after the country's liberation. God directly guided Rev. Heo Ho-bin and her husband, who established the Inside the Womb Church, to make internal preparations to attend the Returning Lord. This included making clothes that would fit him for every year of his life from birth to age 33. True Father said, "The Holy Lord Church led by Rev. Kim Seong-do and the Inside the Womb Church led by Rev. Heo Ho-bin were connected to True Mother through Daemonim." Throughout her life, Hong Soon-ae (Daemonim) made many conditions of devotion to meet the Returning Lord. Also, when she joined the Holy Lord Church and the Inside the Womb Church, she dedicated herself to these churches. During that time, Rev. Heo's mother gave a blessing to True Mother, "You will be Heaven's Bride." This signified that the entire foundation of the conditions of devotion made by all these Spirit-led churches was bequeathed to True Mother through Daemonim. 8 In 1944, one year after I was born, my mother and grandmother Jo Won-mo joined the Inside the Womb Church, where preparations were being made to attend the Returning Lord. Rev. Heo Ho-bin told the members, "Each and every woman in the church should make at least one set of clothes for the Lord. Otherwise, when he comes you will be ashamed." One afternoon, around 1:00 p.m., Rev. Heo asked my mother to make a set of clothes for the Lord and complete them before nightfall. It might be possible to make clothes for an ordinary person within several hours, but making clothes for the Lord required extra special care. Still, my mother obeyed and did her best. With trembling hands, she made the clothes with a heart of gratitude. My mother wanted to be like Rev. Heo, who was living a spiritual life of attendance to the Returning Lord day and night. One day she thought to herself, "If only I could meet the Lord once, even in a dream, 1 could die and have no regrets." That night she had a dream. In her dream, she was wearing a white Korean dress. She was in a clean three-room house with a thatched roof. Having prepared breakfast, she was coming out of the kitchen, drying her hands on her apron, when Grandmother Jo said, "Not just anyone is allowed to come into this room." Still, she opened the door, and without saying anything, quietly entered the room and sat down. There she saw a man, physically well-built and wearing a headband, sitting at the table facing the east and studying. All of a sudden he turned around and looked at her, and said, "I have been studying hard in order to find you." 9 One day, Rev. Heo Ho-bin told my mother about a revelation that she had received. "I was told that you should go to Anju and buy new shoes for the Returning Lord and his Bride, and also a traditional Korean hat for him." My mother departed as soon as she heard this. She went to a well-known craftsman who made those items and asked him sincerely, "Please make them with your utmost devotion. I will pay you as much money as you want. Just make them to the best of your ability." She gave him the sizes for the items and left. One week later, my mother went to pick up the items. She was pleased with the shoes but not with the hat. As soon as the craftsman handed her the hat, she felt her arms starting to get numb and saw the sky turning yellow. Her entire body was paralyzed, she could not move at all, and her feet were stuck to the floor. When she said to the craftsman, "You must make it again," little by little her body returned to its normal state. My mother was very upset, and she scolded him for not making it properly. He was shaken, and he promised to try his best to make it right. A week later, she went back to that craftsman. This time she was well pleased with the hat. She was relieved by this and, after paying for the shoes and hat, brought them back to the church in Pyongyang. Later when she shared her experience about the incident, Rev. Heo laughed with joy. After about a month, my mother had another dream. She used to have very vivid dreams. In this dream the same man whom she had seen in her dream the previous month appeared again and said, "I need to go to the North and study more. So prepare your favorite sleeping pad and blanket; also a suit of clothes. Put them in my backpack for me to carry with me." She answered that she would do so, and returned home. Still in the dream, she entered her house, and amazingly, a clean blanket and sleeping pad were already prepared and waiting for her. There was even a suit of clothes; it was light-colored and the fabric was of excellent quality. Thinking, "How incredible! How can I ever express my gratitude enough?" she packed them in a backpack with wholehearted devotion and offered it to the man. 10 In August 1946, one of the Inside the Womb Church members defected to the communist authorities. Rev. Heo Ho-bin and other Inside the Womb Church leaders were arrested by the police and imprisoned at the Daedong Detention Center. During the interrogation, whenever they asked Rev. Heo, "When will the baby Jesus be born?" she kept on saying, "In a few days." That was what the messages from heaven had told her to say. 11 Sometime in June of 1946, Father left Seoul and went to Pyongyang in the North. He evangelized there and found a lecture room in Gyeongchang-ri where he could meet his followers. Around that time the communist authorities began to persecute religious groups. Rev. Heo Ho-bin and her main church leaders were incarcerated at the Daedong Detention Center, charged with operating a pseudo-religion. Father was incarcerated at the same facility. He was charged with two counts: leading a pseudo-religion, similar to the charge against Rev. Heo, and being a spy for South Korean President Syngman Rhee. The Inside the Womb Church was prepared in the position of the providential Bride, but it failed to come to True Father, who was in the position of the Bridegroom. From inside the prison Father twice sent messengers to Rev. Heo to let her know who he was, but she rejected those messages. Yet even in the prison God continued to work to bring her to Father. Father was imprisoned for 100 days, beginning on August 11. During that time he attempted to contact Rev. Heo Ho-bin several times, but she never recognized who Father was, even to the very end of her life. She rejected God's providential efforts to approach her and His loving heart to spare her life and ended up going the way of faithlessness and death. 15 After True Parents' Holy Wedding, Daemonim and True Mother had to work hard to deal with criticism from all kinds of women, ranging from the wife of the laborer to a lady from the line of the royal family. Mother could not endure this all by herself; three generations—grandmother Jo Won-mo, Daemonim and True Mother—had to face it together. Knowing Daemonim had fulfilled her responsibility in this, I gave her the title Daemo, which means "Great Mother." The way of love that all women have to walk has high walls to overcome. Unless True Mother could take those walls down, women would come to blame her. Daemonim appealed to God, crying out that she could take all True Mother's burdens on her behalf, and she actually did so. She also ardently prayed that she could dissolve all the worries, bitterness and sorrows of the True Family. Now, having passed through the painful path of sacrifices, we have come to the era when we can go over the national level and even the world level and proceed toward the world of unity and liberation. Hong Soon-ae truly accomplished all her responsibilities; hence, she deserves to be attended by all. That is why I named her Daemonim. loyal heart she dedicated herself" to God and True Parents. Anyone, like her, who goes to the spirit world after a life of sacrifice lived with single-minded devotion will open the gate to receive blessings from God free from any accusation. 16 Daemonim's entire life of faith and devotion had only one objective. We must especially remember that from the beginning she was part of the new providential work that included proclaiming that the Returning Lord would be born on earth as a human being. She participated in the new churches that God created for that purpose. Rev. Kim Seong-do, founder of the Holy Lord Church, was the first generation; another line was represented by Rev. Heo Ho-bin of the Inside the Womb Church. Their work laid the foundation that was bequeathed to True Mother. They formed the mainstream history from which Daemonim inherited the tradition of faith; but she was the first of these forerunners to actually attend the Returning Lord.